NASA astronaut Kjell Lindgren pulling Pedro Duque on a stretcher in a simulated lunar rescue. 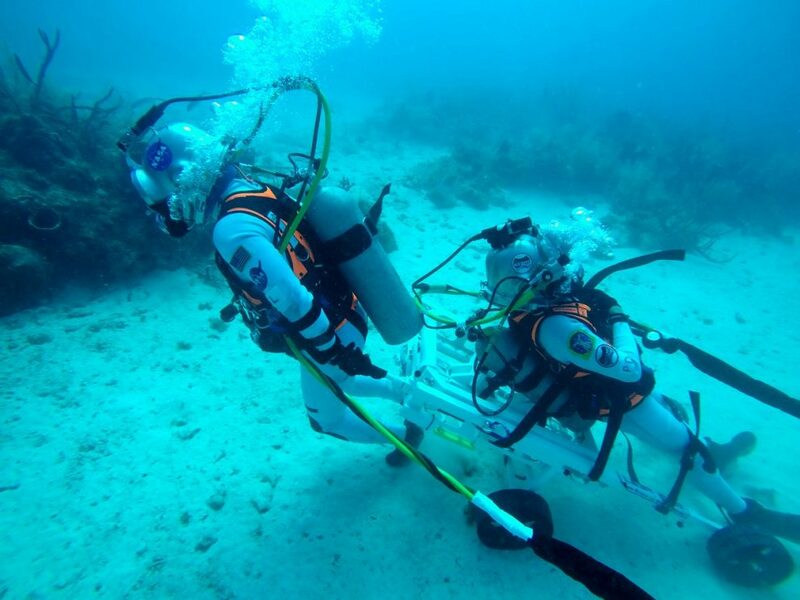 The crew took part in NEEMO 22, the 22nd NASA Extreme Environment Mission Operations mission, consisting of astronauts, technicians and scientists living in the Aquarius underwater habitat off the coast of Florida. The habitat acts as a makeshift ‘space base’ for the aquanauts to make regular ‘waterwalks’ in full scuba gear and, by adjusting their buoyancy, they can simulate the gravity levels found on the Moon, Mars or asteroids. The Lunar Evacuation System Assembly allows for quick recovery of a Moonwalker while keeping the limited mobility of a spacesuit in mind. A foldable pyramid-like structure on wheels that opens above the astronaut, it lifts the incapacitated figure using pulleys and places it on a wheeled stretcher. Pedro and Kjell took turns to be the fallen astronaut and coming to each other’s aid.